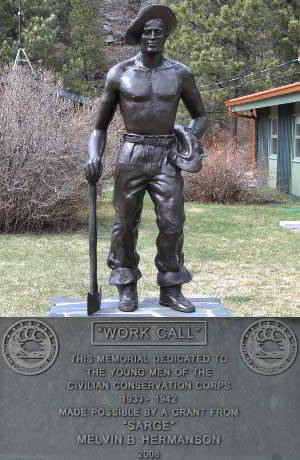 Edward Briggs was born in Hawarden, Iowa and was 20 years old when he entered the Civilian Conservation Corps. His service records indicate that he entered in May of 1933 at Fort Meade. His first camp assignment was Rockerville south of Rapid City. Briggs was Assistant Leader at the camp. Over the period of May 1933 to March of 1935 Edward Briggs served at Rockerville, Pierre, and Presho. His had the title of Assistant Leader at all locations and was honorably discharged. Edward earned American National Read Cross first aide certification at Camp Farm Island, S-207 east of Pierre, South Dakota while with Company 2756. 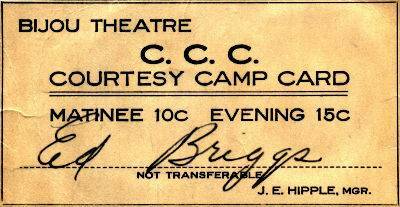 One interest item from Edward Briggs' time in the Civilian Conservation Corps is his Bijou Theatre C.C.C. Courtesy Camp Card. Matinee 10c Evening 15c, not transferable, J.E. Hipple, Mgr. The Bijou Theatre began operating in February 1908, said a brief article in a 1913 issue of The Moving Picture Age. The building had been the city’s opera house prior to its conversion into a combination movie and vaudeville theater by the new operator, Mr. J.E. Hipple, a former postmaster of Pierre, and editor and publisher of a daily newspaper called the Capital Journal. The Bijou was the first in Pierre to present a film with sound in 1930.